I was asked to do a review of Squishy Mat Dog Mat in exchange for the product. Harry said I should definitely take the opportunity to try it out, so we did and here is what we think. .. When my eleven year old Lab started getting up there in years we started looking for a dog bed that was very comfortable for him. 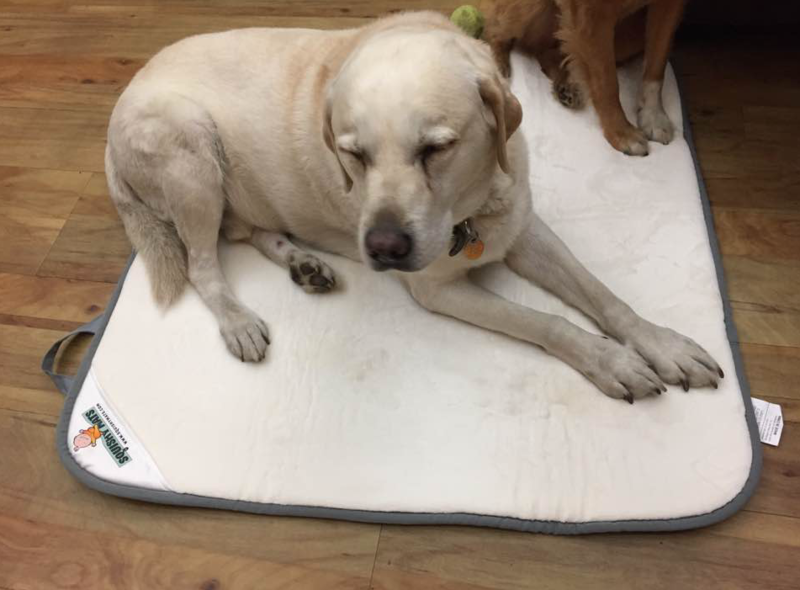 There were a lot of choices out there and we have tried a few but as you can see he loos super comfortable and satisfied on his Squishy Mat 3×3 and we are quite happy. If you have never heard of Squishy mats they are simply wonderful. These dog mats are made from 1” Memory foam. They are great for dogs with a non-slip rubber grid bottom and the top is a micro-flannel that is so soft and comfortable. The construction is very sturdy and made to endure the life of a dog. The Squishy Mat for dogs comes in three different sizes. The biggest one is 4’ X 4’. The next size down is 3’X3’ and then, finally, the smallest is the 16”X32”. They all fold up and have a carrying handle. The small one is perfect for not only small dogs as a bed but for big dogs that have their own spot on your favorite couch or chair.We got the 3’X3’ and it is very nice sized and roomy. As you can see Pyper can even fit on the mat with him. I love that the top is super soft but the bottom is a durable rubber that keeps it from sliding across the floor. It comes in a standard cream color. One of my favorite things is the fact that I can simply roll it up, fasten it, grab the handle and go. It works as great in the car as it does in the house. It is so soft even the kids love sitting on it with the dog. If you have several small dogs the two bigger sizes are perfect. The 3’X3’ is the right size for 2 – 3 Yorkies or similar size dogs. Or by the smaller one and let them each have their own. We love our Squish mat and so does Harry. It is one of the best doggie items we have received and there have been quite a few. It also makes a great gift for the dog in your family.